Happy Father's Day, Matt! I know you'll be getting a lot of well wishes, but let me be the first one in my time zone to post a greeting. Matt Patterson is the author of a short and sweet memoir, My Emily. If ever there is a Father's Day story, this one is it. Rachelle: Matt, tell us a little about Emily's story and why you wrote your book. Matt: First and foremost, thank you so very much for the Father's Day wishes and for the opportunity to be here! I truly appreciate it! Emily was our first-born daughter. Just like any set of first-time parents, we were absolutely giddy at the thought of having a child! Everything went along as planned and delivery day came. We had an almost seven-pound baby girl. As I say in the book, "Bubble gum cigars for everyone!" I ran and made the customary calls. We were just beyond overjoyed. 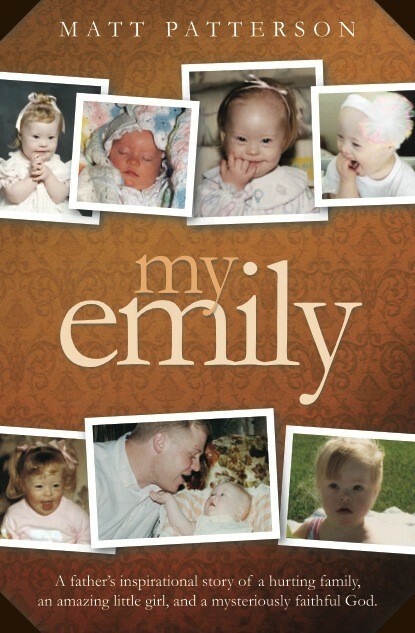 The next morning came and it was then that we were told that Emily was born with Down Syndrome. To say we were blind-sided is a huge understatement. Beyond the initial shock and disbelief came the joy. Emily was an absolute joy, full of love, happiness and smiles. Just two years later - on my birthday - after a late-night visit to the emergency room to combat a fever and flu-like symptoms we were told that Emily had leukemia. My Emily tells of our journey - from Emily's birth, diagnosis, treatment and eventual passing. It shares how we reacted to each of these, as well as how we have moved forward with hopes of helping others. As to the "why" I wrote it? I think each and every day I get some small answer or confirmation from someone who reads it. It can be an email, a facebook posting, a tweet on Twitter or a review on Amazon. I'm still formulating my "why" but, I do want to reach out to those who have special needs children, little ones battling or have battled cancer and to those couples who are grieving the passing of a child. Is my little book sad? I just want to reach down and try to help them up during a tremendously difficult period in their lives. Rachelle: While you were writing, did you know your book would be a help to grieving parents? I know you helped me remember my son who lived only 21 days in the NICU. I have to admit there were times early on when I coped by obsessive work and ignoring my feelings. Reading about your good days and bad days helped me to accept what cannot change and acknowledge the empty spot in my heart without dwelling on it. Matt: You're very, very kind Rachelle. Initially, I was just hopeful that it could be a help to THIS grieving parent. The book actually wasn't written until nearly 20 years after her passing. There was a great deal of that needed to take place before I wrote it. Since its release, I have received so many heartwarming emails, notes and messages from parents who have a Down syndrome child or a Down syndrome child battling leukemia. I also receive communication from parents who have children fighting for their lives with other ailments and for anyone to take the time to share that they have read my book and it touched them in some small way takes me one step closer to my "why," as mentioned in the previous question. Rachelle: Emily seems so real to me. Has writing the book made her more alive to you now? Do you think about how old she'd be and what she'd be doing? My son would be getting his driver's license had he lived. Scary, huh? Matt: I do have to say that she is so very much more alive to me today. Scary? I'm not so sure. It would be exciting to me. Are there days I think about her and have a very good cry? You bet! Are there times I look at photos or listen to music that reminds me of her? Absolutely! To think that her sisters - Lauren and Kimberly - could be a part of her life would be beyond words for me. Both of my daughters are very aware of Emily and what she means to them, even though they never really knew her. To be with all three on Father's Day would be remarkable. Rachelle: I truly understand and share your feelings. How important is God in the healing process? Matt: For me, He is a critical part of my healing process. I don't proclaim to be a spiritual or scriptural authority. Far from it actually. Each person has their own set of beliefs. Mine may be very different from the many who have read My Emily. I tried to be as careful as possible not to offend anyone while sharing important facets of my journey and my continued healing process. There are two scriptures that have been a very important part of my journey toward healing. The first - 1 Peter 5:7 - "Cast all your anxiety on him because he cares for you." The second - Ecclesiastes 4:9-10 - Two are better than one ... If either of them falls down, one can help the other up." Even though I can be consumed with anxiety of my circumstances, I know God truly cares for me. There are moments when I come across someone who needs a shoulder to lean on or an ear to listen, I try to be there for them. I listen. I share. I try to help the other up. Rachelle: Do you believe God never gives you more trials than He can bring you out of? Matt: Plain and simple - I'm a firm believer God can teach, touch and bring us out of our despair and anxiety. There is a hymn that comes to mind when I become overwhelmed with my circumstances. During those moments of trial and tribulation take that moment and count your blessings. Really see what God has done. You may just surprise yourself. Rachelle: I agree. God never ceases to surprise me with His daily blessings. So, what's next? I heard rumors of an audio version of My Emily. Do you have plans for another memoir or perhaps fiction? Matt: The rumor about an audio book of My Emily is absolutely true. It's my hope that it will be available in July. There is also a very strong possibility that My Emily will also be available as a hardback this summer as well. I do have two memoirs brewing, but they will take a back seat to my next project which will be a non-fiction how-to book aimed at helping families with their grief and how they can move forward to help others. Now, as far as fiction - Matt Patterson and fiction just don't mix. I'm not that talented or creative to write fiction. I marvel at writers who construct and create their stories and characters. For me, I write as if my readers are sitting right across from me. I tell them my story. I poke a lot of fun at myself throughout My Emily. There are plenty of moments where you get to laugh at me. Rachelle: Yes, it's true. Despite the tears, you also made me laugh. I'm looking forward to your next projects. So, tell us about your family. I have been married for 27 years to my wife Bonnie. As I mentioned earlier, we have two daughters - Lauren (22) and Kimberly (20). We also have two doggies - a cockapoo named Isabelle (Izzy) and a pit bull (long story don't ask), named Lupe. We have called Arizona home for the last 12 years. Okay, I won't ask. Thanks for visiting with us. I'm sure you'll have a wonderful Father's Day. It's been wonderful having you, and I wish you well in all your endeavors. Thank you so very much Rachelle! It's been a true pleasure to share with you and your readers! You have been such a wonderful support to me and to My Emily. You have my deepest thanks. From time to time, I hear parents bragging to each other about their "perfect" children. I smile knowing that some would look at Emily's life and think that a child born with Down syndrome has little hope for a meaningful life. Throw in the diagnosis of leukemia and that little hope turns to no hope whatsoever. I disagree. Patterson, Matt (2011). 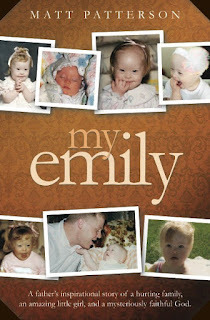 My Emily (Kindle Locations 775-778). Matt Patterson. Kindle Edition. I agree with Matt. Every child is perfect and precious. Bio: Matt Patterson is the author of My Emily and an award-winning writer, editor and communications professional. His two-plus decades of experience include public and media relations, as well as print and broadcast journalism. He volunteers his time to helping organizations and charities dedicated to assisting families with children who have special needs or those battling pediatric cancers. He resides in Arizona. Thanks for sharing this interview, Rachelle, and thanks, Matt, for sharing your story. Happy Father's Day to you, Matt, and I'm glad the writing process is helping you to heal. A wonderful interview. Happy Father's Day Matt. As a mother this blog post hit home. This is such a personal story and one of the great things about writing. Matt, you've honored Emily well! Happy Father's Day to you!